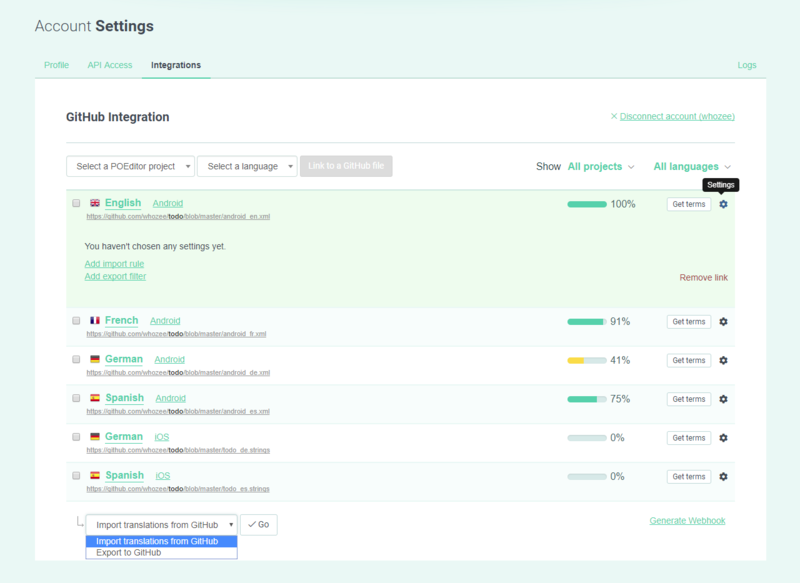 After you've connected your POEditor account with your code hosting platform of choice (in Account Settings), you can manage your localization files effortlessly between our localization platform and your repositories. The screenshots below are from a GitHub integration page, but the options are the same for all three integrations. In the integration page, select a localization project in your POEditor account and a language in that project, then click on the Link to file button. Then select a repo, a branch and the file you want to link and click on Link it. Repeat the process above to link the other languages in your POEditor project with their corresponding language files in your repo. To bring the terms from a file on your repo to your POEditor project, click on the Get terms button corresponding to the language linked to that file. You don't have to click on the Get terms button for each language, unless you have different terms in the files linked to the languages at POEditor, and want to bring them all under the same project. To bring the translations from a file in your repo to a language in your POEditor project, go to the integration page, check the box next to the language, select at the bottom of the page to Import translations from GitHub/Bitbucket/GitLab and press Go. To import translations to more languages at the same time, simply check the boxes next to them too, before clicking Go. Note that you can import translations only after having imported terms. To keep track of an import, click on Settings (next to Get Terms) and Add an import rule. You can tag the imported terms (All, New, Obsolete or With changed translations) with one or more tags of your choice. Tags can be used to filter strings during translation and/or on export. To export strings (both terms and translations) from your POEditor project to the files on your repo, select your desired languages, choose at the bottom of the integration page to Export to the code hosting platform you use and press Go. To export just specific groups of strings, use the Add export filter option in Settings. 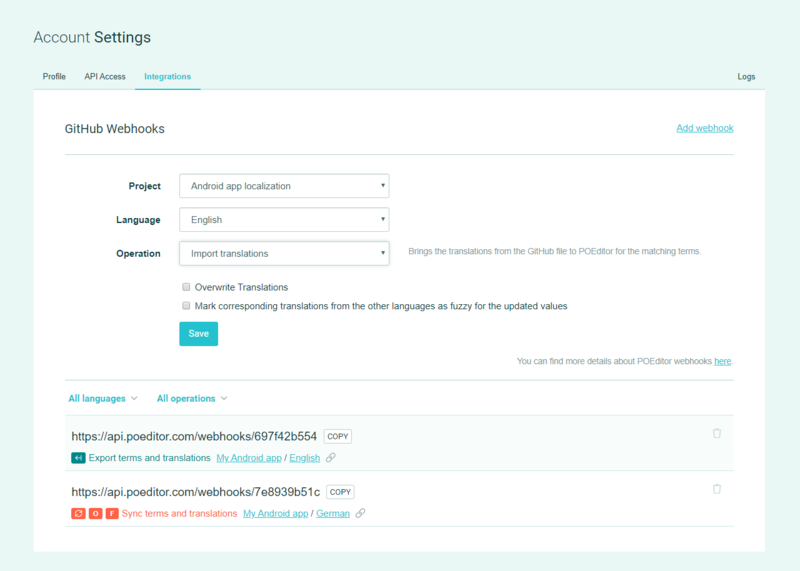 Since the integrations with code hosting platforms are made at an account level and, because of privacy reasons, can be managed only by the account owner, webhooks are a good solution if you want to allow another person (a POEditor user or not) to manage data between POEditor and your repos. When the webhook is triggered, the assigned languages/projects on POEditor receive data from the file on the repo that is connected to it, or the other way around. Each integration page has its own webhook generator. With webhooks, you can import/export terms and/or translations and also automatically sync the terms whenever you make changes in your repos. The sync operation brings terms and translations from the file on your repo to the linked language at POEditor. It also deletes any obsolete terms in the POEditor project (terms which appear in the project but don't exist in the file). How your webhook behaves is determined by how you set it up in the integration page, in the Settings of each linked language.